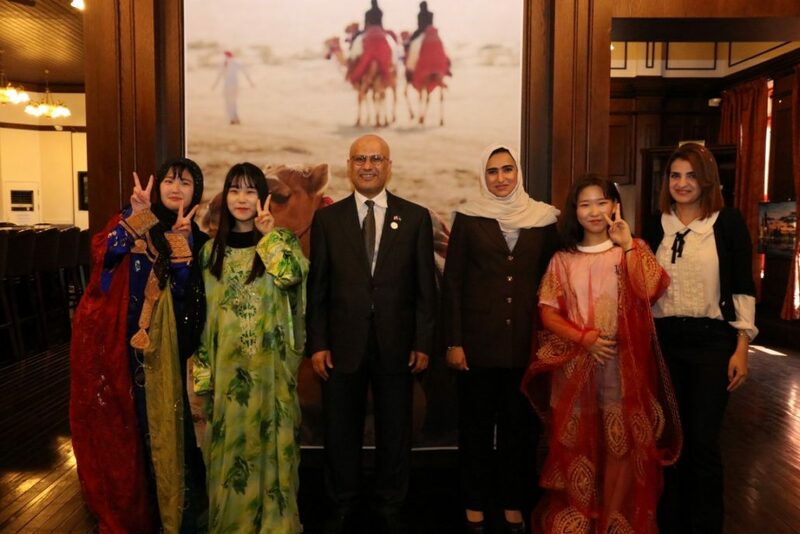 (Seoul) – The UAE Embassy in Seoul participated in a cultural exchange exhibition at the Jemulpo Gurakbu centre in Incheon, Korea. Celebrating the Year of Zayed, the Embassy presented UAE cultural and handicraft items for viewing at the exhibition, which also showcases the late Sheikh Zayed bin Sultan Al Nahyan’s achievements. It also features must-see tourist destinations in the UAE, including a series of videos promoting the UAE tourism sector. Attracting over 200 visitors daily the exhibition will take place throughout August. Rachid Al-Shamsi, UAE Embassy Chargé d’affaires, and Mhra Al-Dhahani, Second-Secretary at the Embassy, visited the exhibition. During the visit, the Jemulpo Gurakbu General Director, Cheon Gwang Sig, and General Manager, Yun Hee Won, expressed their sincere thanks and appreciation for the support provided by the UAE Embassy. The Embassy representatives answered questions related to the UAE’s tourist attractions and landmarks by members of the public visiting the exhibition, along with questions on the cultural items showcased in the exhibit and their historical significance to UAE culture.